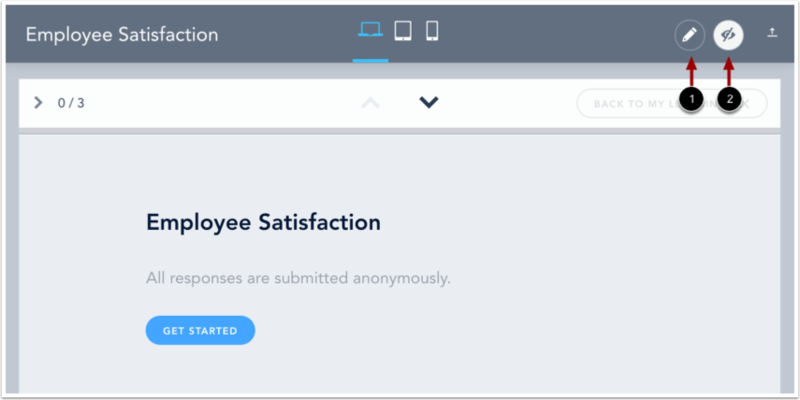 You can preview the way a survey will behave when a learner interacts with it, as well as toggle between edit and preview mode for individual questions. The Submit and Back to My Learning options are disabled in preview mode. Note: Once a survey has distributions, it cannot be edited. Edit survey content as necessary. You can toggle between edit and preview mode for the selected question you are currently viewing . To open preview mode, click the Preview icon . 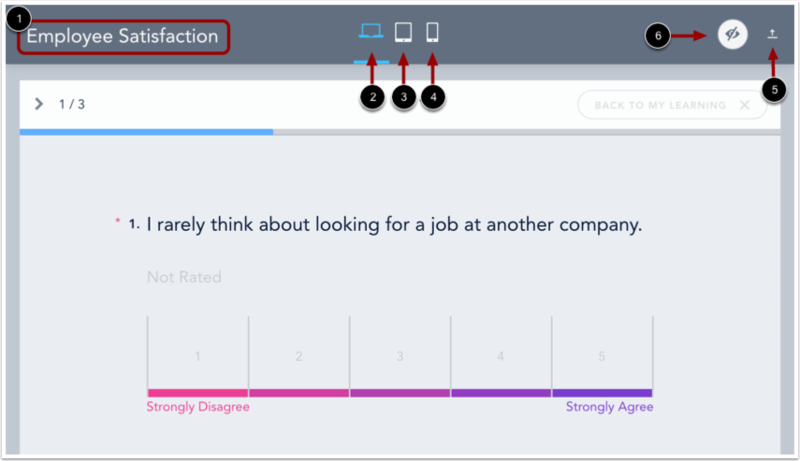 In preview mode, you can view the survey as if you were a learner interacting with and taking the survey. 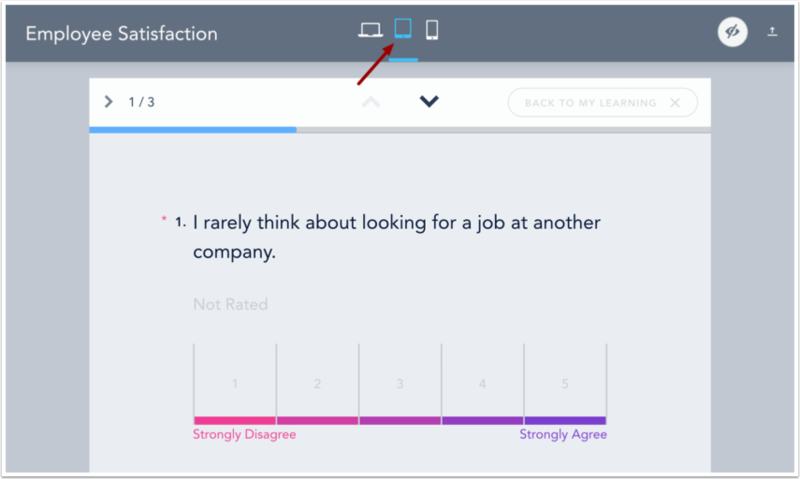 Learn more about how learners navigate through a survey. In the header, you can view the survey name  and the dimensions for the selected device. Desktop  preview is selected by default. 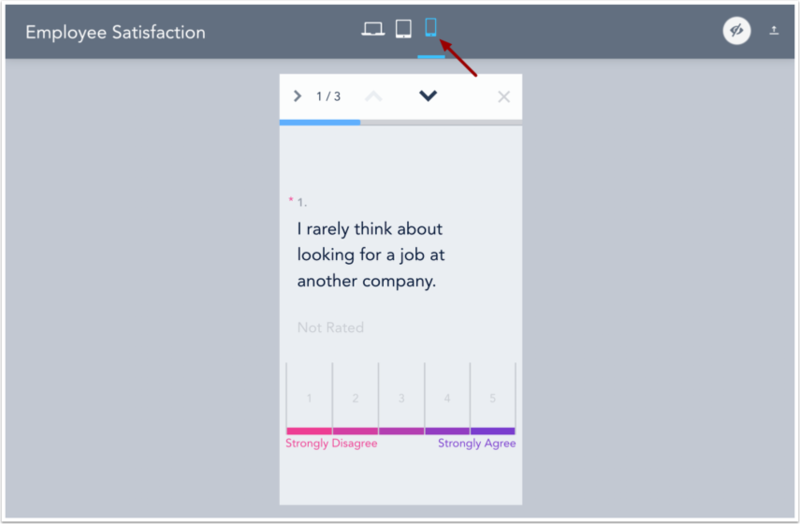 Click the Tablet  or Phone  icon to preview the survey on a different device. To show or hide the header, click the show/hide icon . To leave preview mode and return to the currently selected question in the content editor, click the Preview icon . Note: The Submit and Back to My Learning options are disabled in preview mode. To preview what the survey will look like on a tablet, click the Tablet icon. To preview what the survey will look like on a phone, click the Phone icon. 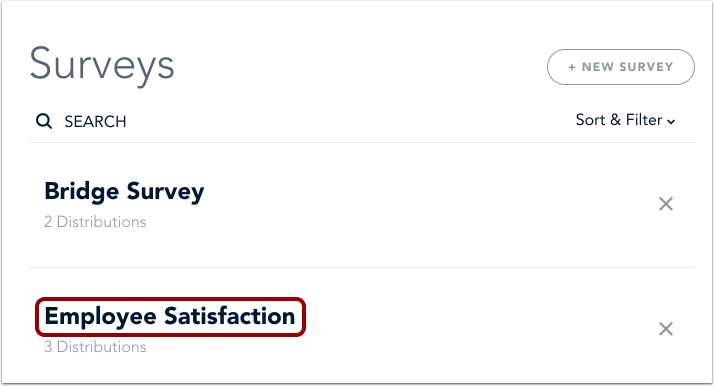 On the survey details page, click the Preview icon. Preview the survey. To edit the survey, click the Edit icon . To return to the survey details page, click the Preview icon . When you are ready to distribute your survey, on the survey details page, click the Add Distribute button. Previous Topic:How do I edit survey content? Next Topic:How do I distribute a survey? Table of Contents > Manage Surveys > How do I preview a survey?